Figure 1. While it may seem like the Keynesian and neoclassical perspectives are like two horses riding in different directions, both models offer important insights into economic behavior and can be applied in different situations. Finding the balance between Keynesian and neoclassical models can be compared to the challenge of riding two horses simultaneously. 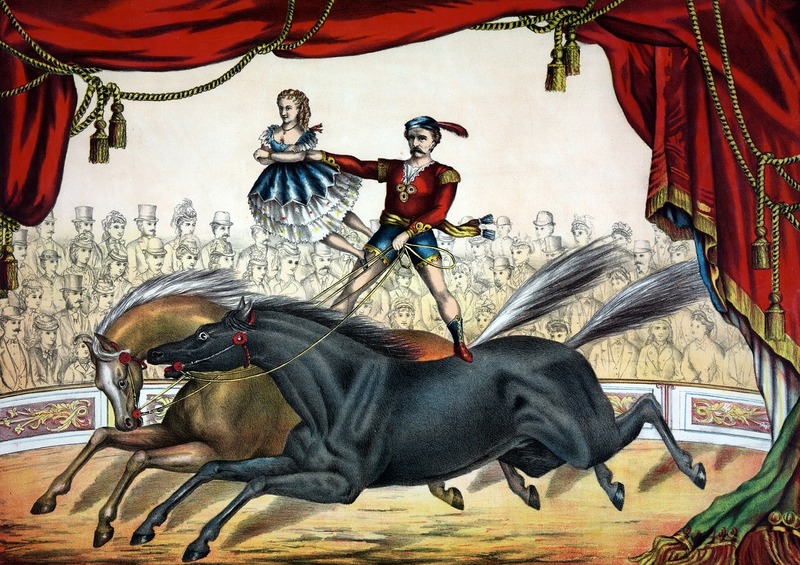 When a circus performer stands on two horses, with a foot on each one, much of the excitement for the viewer lies in contemplating the gap between the two. As modern macroeconomists ride into the future on two horses—with one foot on the short-term Keynesian perspective and one foot on the long-term neoclassical perspective—the balancing act may look uncomfortable, but there does not seem to be any way to avoid it. Each approach, Keynesian and neoclassical, has its strengths and weaknesses. The short-term Keynesian model, built on the importance of aggregate demand as a cause of business cycles and a degree of wage and price rigidity, does a sound job of explaining many recessions and why cyclical unemployment rises and falls. By focusing on the short-run adjustments of aggregate demand, Keynesian economics risks overlooking the long-term causes of economic growth or the natural rate of unemployment that exists even when the economy is producing at potential GDP. The neoclassical model, with its emphasis on aggregate supply, focuses on the underlying determinants of output and employment in markets, and thus tends to put more emphasis on economic growth and how labor markets work. However, the neoclassical view is not especially helpful in explaining why unemployment moves up and down over short time horizons of a few years. Nor is the neoclassical model especially helpful when the economy is mired in an especially deep and long-lasting recession, like the Great Depression of the 1930s. Keynesian economics tends to view inflation as a price that might sometimes be paid for lower unemployment; neoclassical economics tends to view inflation as a cost that offers no offsetting gains in terms of lower unemployment. At short time scales, I think, something sort of ‘Keynesian’ is a good approximation, and surely better than anything straight ‘neoclassical.’ At very long time scales, the interesting questions are best studied in a neoclassical framework, and attention to the Keynesian side of things would be a minor distraction. At the five-to-ten-year time scale, we have to piece things together as best we can, and look for a hybrid model that will do the job. Many modern macroeconomists spend considerable time and energy trying to construct models that blend the most attractive aspects of the Keynesian and neoclassical approaches. It is possible to construct a somewhat complex mathematical model where aggregate demand and sticky wages and prices matter in the short run, but wages, prices, and aggregate supply adjust in the long run. However, creating an overall model that encompasses both short-term Keynesian and long-term neoclassical models is not easy. The Great Recession ended in June 2009 after 18 months, according to the National Bureau of Economic Research (NBER). The NBER examines a variety of measures of economic activity to gauge the economy’s overall health. These measures include real income, wholesale and retail sales, employment, and industrial production. In the years since the official end of this historic economic downturn, it has become clear that the Great Recession was two-pronged, hitting the U.S. economy with the collapse of the housing market and the failure of the financial system’s credit institutions, further contaminating global economies. While the stock market rapidly lost trillions of dollars of value, consumer spending dried up, and companies began cutting jobs, economic policymakers were struggling with how to best combat and prevent a national, and even global economic collapse. The Congress passed the American Recovery and Reinvestment Act in early 2009 which provided some $800 billion worth of fiscal stimulus through tax cuts and government spending increases. Were the policies implemented to stabilize the economy and financial markets during the Great Recession effective? Many economists from both the Keynesian and neoclassical schools have found that they were, although to varying degrees. Alan Blinder of Princeton University and Mark Zandi for Moody’s Analytics found that, without fiscal policy, GDP decline would have been significantly more than its 3.3% in 2008 followed by its 0.1% decline in 2009. They also estimated that there would have been 8.5 million more job losses had the government not intervened in the market with the TARP to support the financial industry and key automakers General Motors and Chrysler. Federal Reserve Bank economists Carlos Carvalho, Stefano Eusip, and Christian Grisse found in their study, Policy Initiatives in the Global Recession: What Did Forecasters Expect? that once policies were implemented, forecasters adapted their expectations to these policies. They were more likely to anticipate increases in investment due to lower interest rates brought on by monetary policy and increased economic growth resulting from fiscal policy. The difficulty with evaluating the effectiveness of the stabilization policies that were taken in response to the Great Recession is that we will never know what would have happened had those policies not have been implemented. Surely some of the programs were more effective at creating and saving jobs, while other programs were less so. The final conclusion on the effectiveness of macroeconomic policies is still up for debate, and further study will no doubt consider the impact of these policies on the U.S. budget and deficit, as well as the value of the U.S. dollar in the financial market.